PST viewer tool is the smartest option to open and read Outlook PST files without Microsoft Outlook installation. 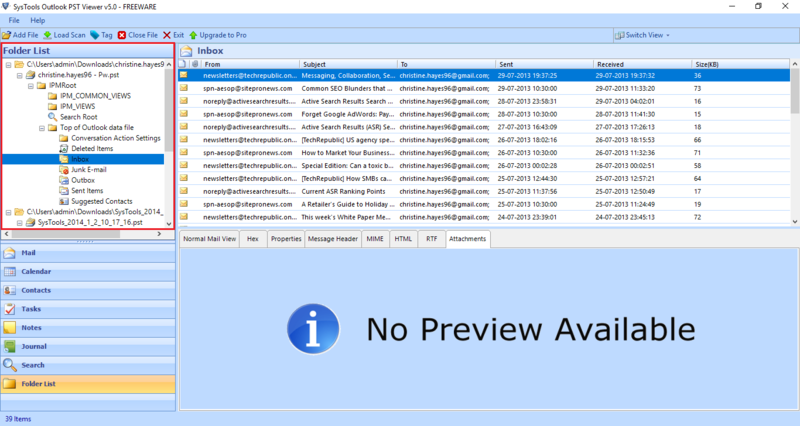 This freeware application loads entire Outlook emails and provides an instant preview of PST data in the software Preview Panel. 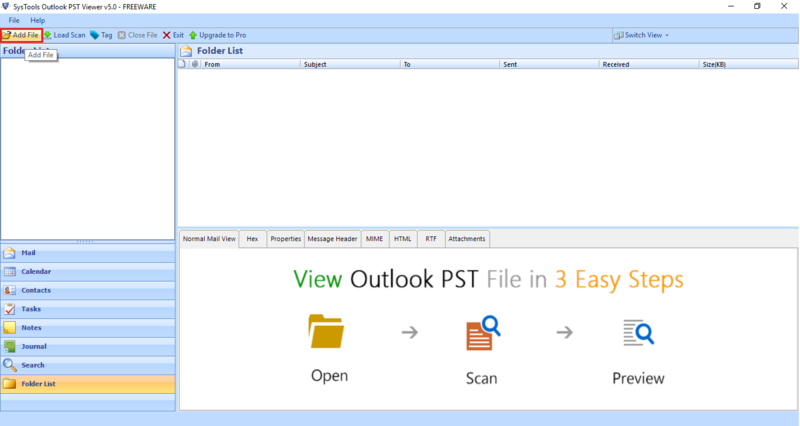 The free PST Reader tool offers scanning mode to scan and read PST files in Outlook. The Quick scan for minor corruption and Advanced scan for major corruption. Outlook PST Viewer freeware is compatible with almost all versions of Outlook like 2016 (32 & 64 bit), 2013 (32 & 64 bit), 2010, 2007, 2003, 2002, 2000. Outlook PST file Viewer tool allows you to view PST file data items such as emails, contacts, calendars, notes, tasks, journals etc without installing Microsoft Outlook program. The PST Reader also has an option to view Outlook archive folder. All data will be displayed in normal view, property view, and the preview of email attachments in a .pst file without Outlook installation. 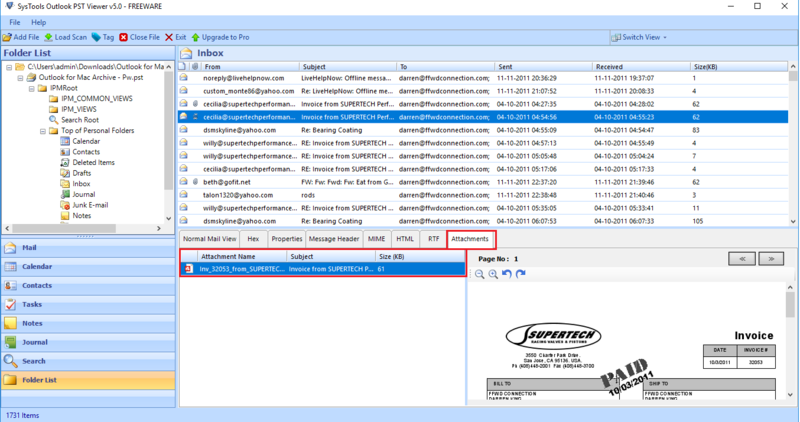 This free PST File reader tool offers two scanning modes to view Outlook data file. These are: Quick Scan and Advance Scan. Advance scanning mode is available with proper file indexing that is used for scanning damaged PST file. For detailed analysis report of Outlook PST files, Advance scan mode is advised or else uncheck the option. If you want to read PST file calendar and contacts without Outlook, then this free PST Viewer tool allows you to open PST file contacts and calendars without Microsoft Outlook in the system. This feature will display the preview of Outlook PST contacts and distribution list. Apart from this, the PST Reader tool can also display the preview of Notes, Tasks, and Journals of PST File. 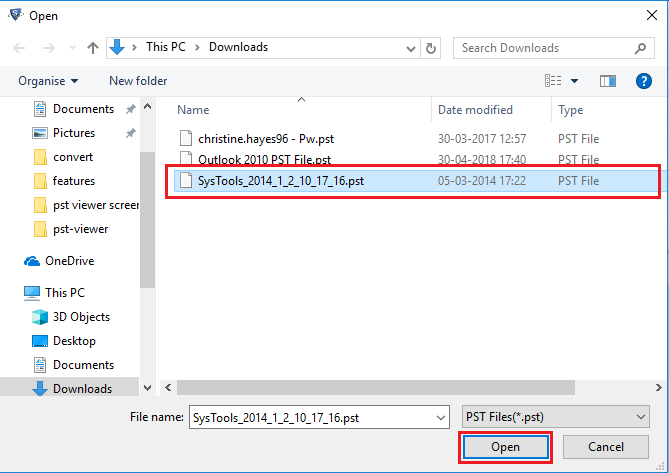 The Outlook PST Viewer software also has an option to open PST files along with its all details. It will also show the number of items present in every folder and create an item preview with all its properties. 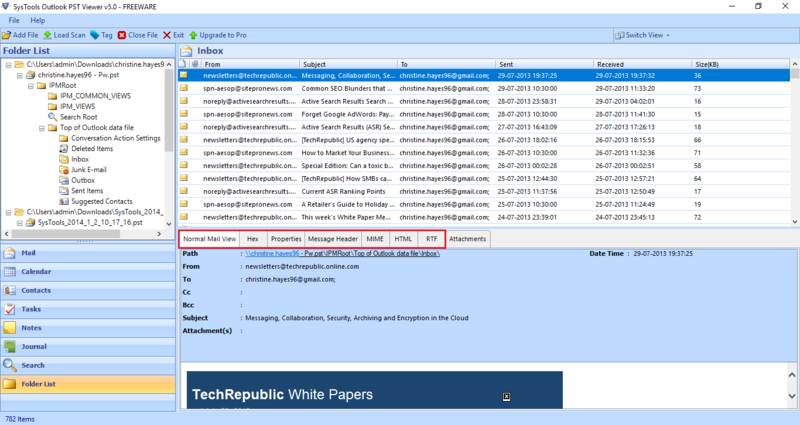 Moreover, you can view all MS Outlook data items along with attributes such as from, subject, to, sent, received, size, etc. 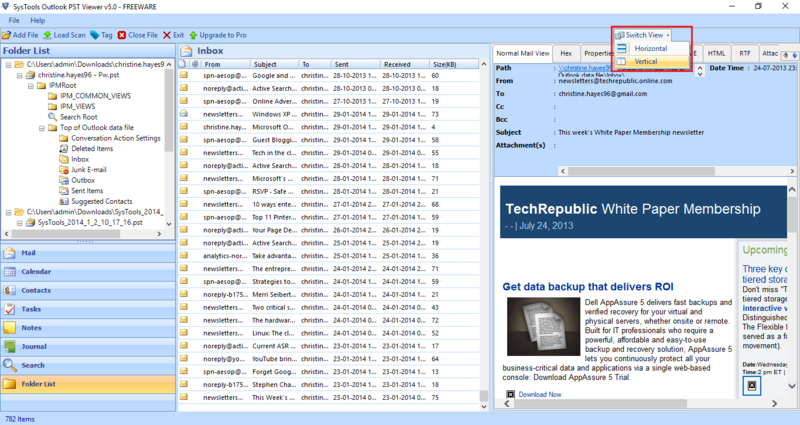 With the help of Outlook PST File Viewer freeware, you can read the Outlook archive files and folders also. This will allow displaying all the archive folders like archive calendar, email, contacts, etc. and these folders can be displayed in Normal view, MIME view and also with attachments. Everyone wants to see the data in an organized way. Also, the PST File Viewer software is capable to preview Outlook PST files in a much optimized way. It will display Outlook data without showing any crash report. Because it has an option to change the location of temp folder from C drive to any other location. It reduces the consumption of main memory space. How to Open PST File Without Outlook Attachments? 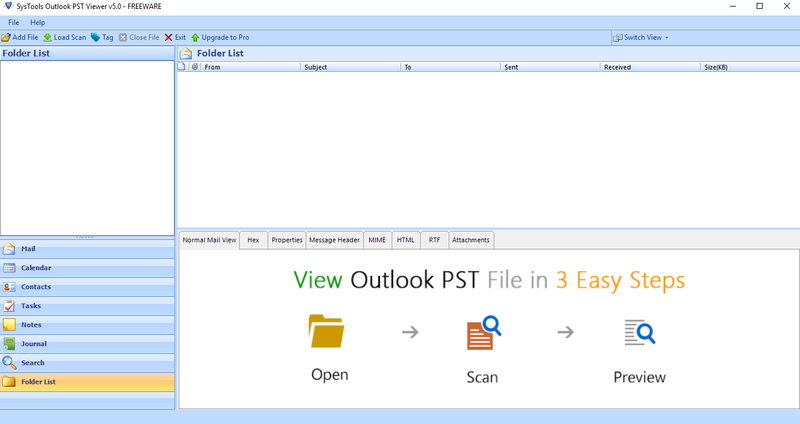 Step 1 : At first, install and open Outlook PST Viewer freeware. Step 2 : Click on the Add File option to add PST files that you need to read. Step 3 : After selecting PST files, click on Yes and proceed to the scanning process. Step 4 : Once scanning will be completed, the tool will display a message. Just click OK to proceed further. Step 5 : Now, you can view your emails, properties, and attachments in Normal View, MIME View, and Attachments Tab. Step 6 : You can also view calendars, tasks, journals, and notes individually. Step 7 : You can apply various filters like To, Cc, Bcc, Sender name, Sent Date etc. if you need to read any specific email. Step 8 : Click on the Export option to export selective Outlook PST files. Step 9 : Now click on the Export button at the bottom left to save PST file in PDF format. Step 10 : After successful completion of exportation, you will get a message. Finally, you can easily read the data from PDF file. Q. How to read PST file without Microsoft Outlook in the system? Q. Does the Outlook PST Viewer support Windows 10? Ans: Yes, this software is fully compatible to work with all versions of Windows operating system along with Windows 10. Q. How much time does this tool take to scan a PST file? Ans: It will take very less time to scan a large PST file. But, the exact scanning time is estimated according to the size of PST file and level of corruption occurs in PST file. Q. Can I open backup file with the help of Outlook PST Viewer freeware? Ans: Yes, you can easily open and view the .bak file by using this software. For this, you just need to browse and add PST files, and then the tool will scan and load all the data. Q. Does the software open a damaged PST file without using Outlook? 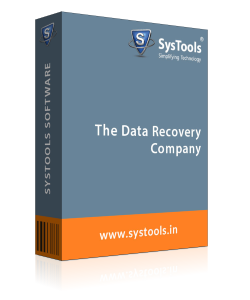 Ans: Yes, the tool is able to scan and view damaged data as well as deleted data from PST file. Moreover, you do not need to install Outlook application to open an orphan PST file without Microsoft Outlook. Note: Outlook PST Viewer Software will get delivered on your registered email id, within few minutes after placing the order. I prefer PST Viewer freeware to read PST file along with its attachments. I never imagined any tool of such kind. The best part of this tool is it does not require Outlook application to be installed. It is really a remarkable tool that works without any technical glitch. I was searching for a tool that allows accessing only the required emails on the basis of different fields. Luckily, I came across with Outlook PST Viewer during surfing on internet. I was surprised after experiencing the filter option and all other marvelous features of this tool. Amazing Tool!! It was really a great experience with this PST Reader tool and its significance. I was stunned after observing its features like accessibility to PST files, opening email attachments, etc. Thus, I want to say thanks to all the developers and appreciate their superb work! !